My recipe for Superbowl 50. In a large 5 quart sauce pan add meat and one TBSP oil and brown. As the meat browns drain the water several times. Remove meat after brown. Add two TBSP oil and add the mirepoix and sauté several minutes. Return meat and add everything else to the pot. Cook on low 1.5 to 2 hours. Serve with cheese. Irish stew (Stobhach Gaelach) is any variety of meat and root vegetables. Originally, the dish used goat meat and now mostly made with lamb. However, lamb can be expensive here and the taste can be too sweet and gamy. My recipe uses pork stew meat. 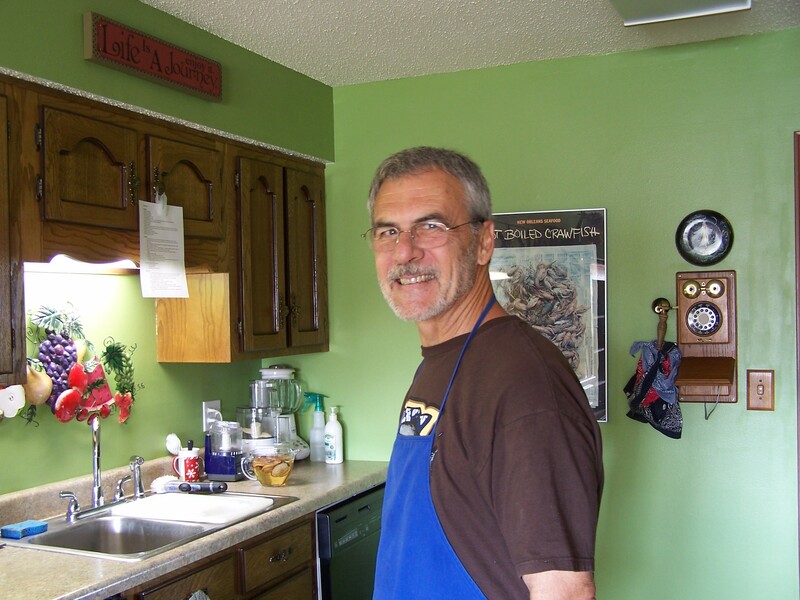 The reason I use pork versus beef is I will brown the pork first to create a fond (The culinary term, French for “base” or “foundation”) as I do in a Jambalaya. I also use less meat, just enough to add flavor. Most recipes are built around a pound of meat. I use one-half pound. After browning the meat, I will also create a demi-roux (butter and flour) to thicken the fluids and create a gravy, then sauté the mirepoix in the roux. I will then add a bottle of Guinness Stout a cup at a time and whisk creating even thicker gravy. This continues to build flavors. I will also add whole potatoes, but mashed potatoes if you desire can be added, which will thicken the gravy further. The other root vegetables and the Brussels sprouts (baby cabbage) are then added. Add herbs and more fluids and cook slow for almost 2 hours on a very low heat. In the olive oil brown the meat and then remove. Add the flour and butter and whisk for several minutes until the flour starts to brown. Add the mirepoix and sauté until you can smell the onions start to cook. Move the mirepoix to one said and add ½ cup of Guinness Stout beer and deglaze that half of the pot. Move the mirepoix to the other side and add another ½ beer and deglaze the other side. Add the remaining beer and stir into a thick paste. Add all the remaining ingredients and return the meat. Add chicken stock until the ingredients are covered. 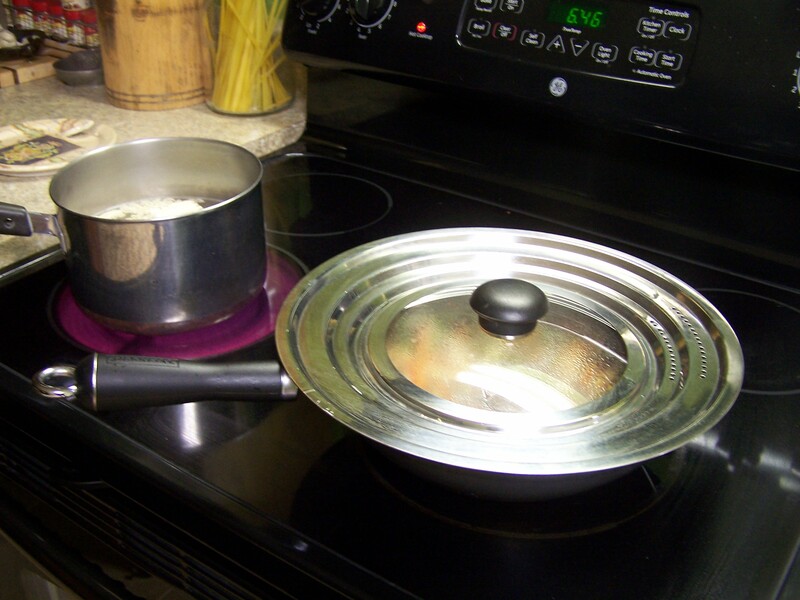 Cover, bring to a boil, then reduce to low and cook 1½ to 2 hours. Gyōza sauce is a dipping sauce used mostly with pot stickers. But, I use it with a piece of salmon. I buy frozen salmon, defrost it, fry it in sesame oil, and then serve it on a salad or on the side with stir fry veggies. I make this sauce for it. This sauce is also served with Hamachi Kama (broiled yellowtail gill plate) at sushi bars. Gyōza is a non-standard Japanese word. The Chinese word Jiaozi means dumpling. These dumplings are stuffed and served boiled, steamed or fried. Baste the salmon with sesame oil and then add one teaspoon of the oil to a nonstick fry pan. Cook a minute or so on each side, then sprinkle with sesame seeds, drop in a dash of Gyōza and cook until done. When eating, dip the salmon in the remaining Gyōza sauce. In between the occasional Cajun roux, I try my best to eat as many greens and vegetables as possible. I have not had a hamburger or a steak in a very long time. In fact, I have reduced my meat intake by more than half. I use meat mostly for the flavor. 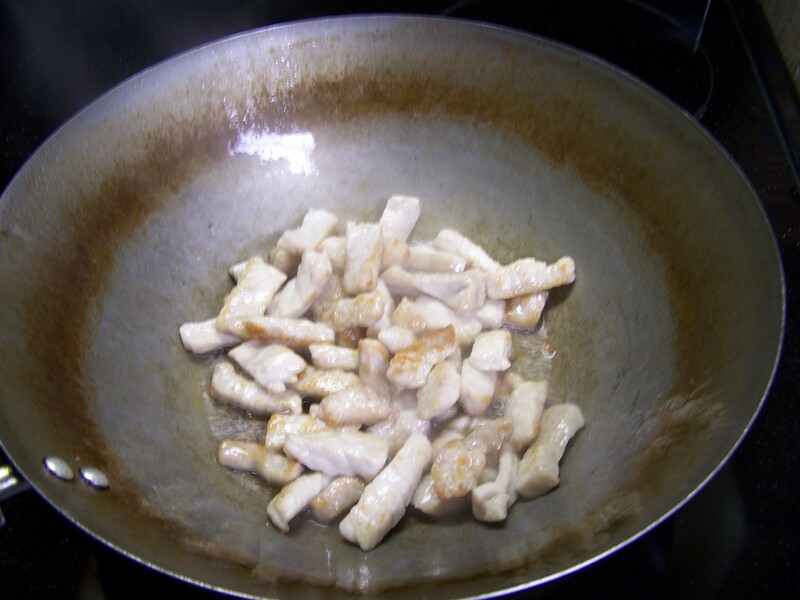 When frying meat, it will leave a brown thick glaze called a “fond”. By adding a little liquid after and scraping the pan the liquid will deglaze the fond and that will add all sorts of great flavors to the dish. Also keep in mind adding onions, celery and some peppers directly after, the sugars are released and adds even more flavor. The idea is to keep building flavor. 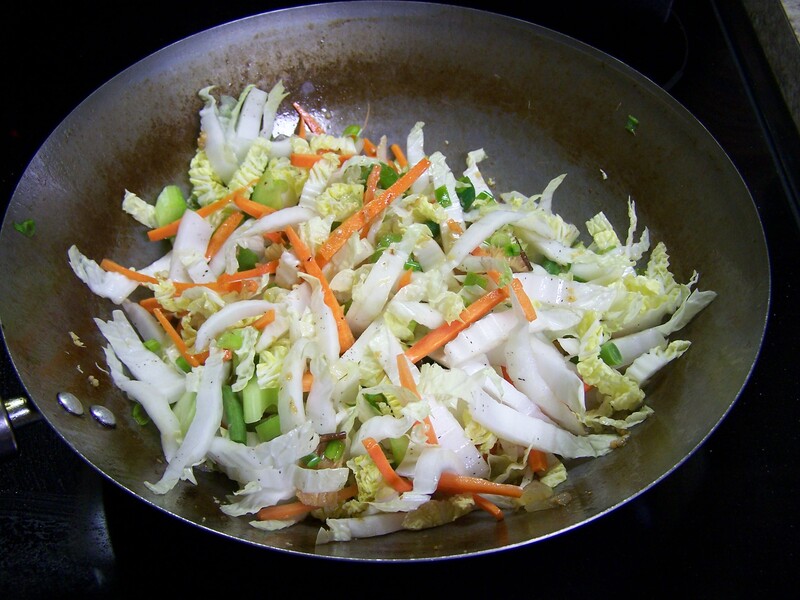 This stir fry recipe can be cooked in a wok or a skillet. As long as the pan is fairly hot. Any meat and any vegetable can be used. 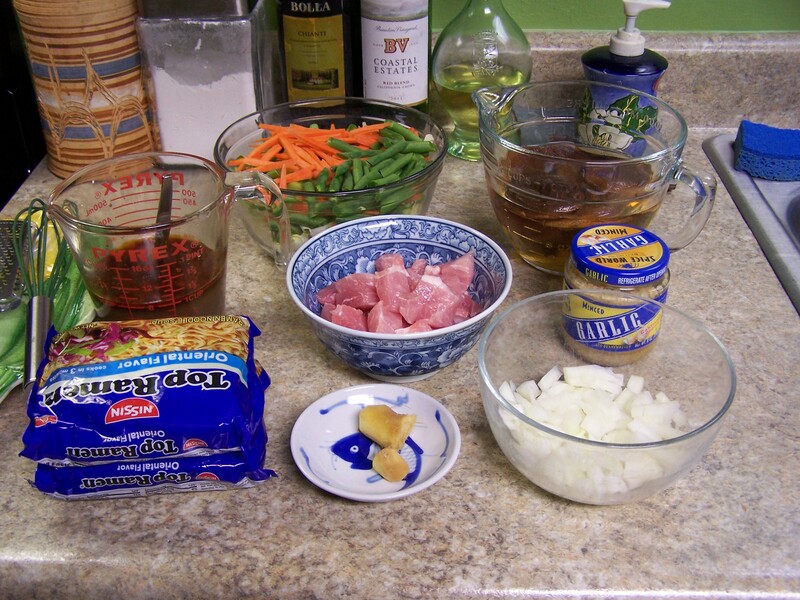 After frying the meat and veggies I use a sauce and then serve that on a bed of cooked Ramen noodles. The Ramen noodles I use are those cheap packs in the store for less than a dollar. I discard the dry seasoning pack. The most important thing is the sauce. This recipe is for 2 servings. 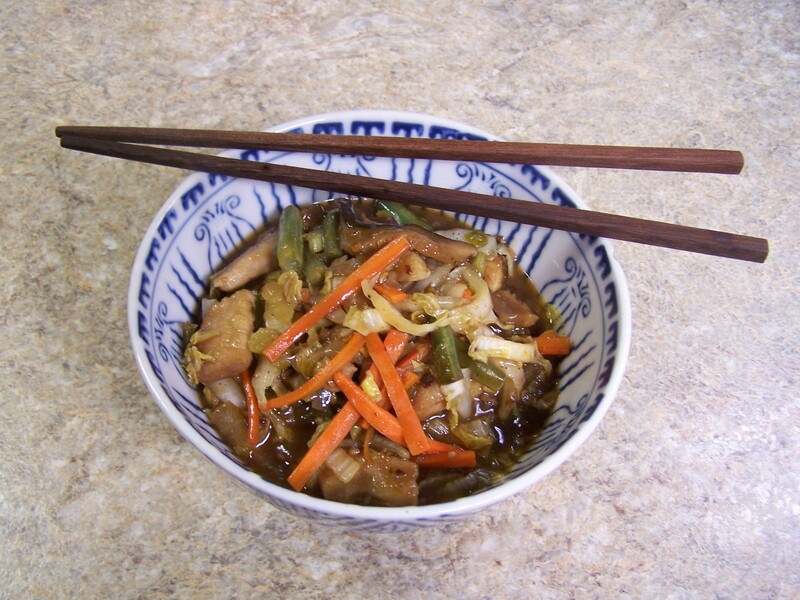 The basic veggies are Napa cabbage (Chinese cabbage), celery, carrot sticks, green beans, shiitake mushrooms (I use dried and re-hydrate), scallions and also daikon radish sticks when available, bamboo shoots or whatever you like. Canola oil (I use whatever I need). To get the wok started first get the wok hot then add the oil. For this dish I start with 1.5 TBSPs. This is where you develop a feel for the food. If you do it this way the meat will not stick. 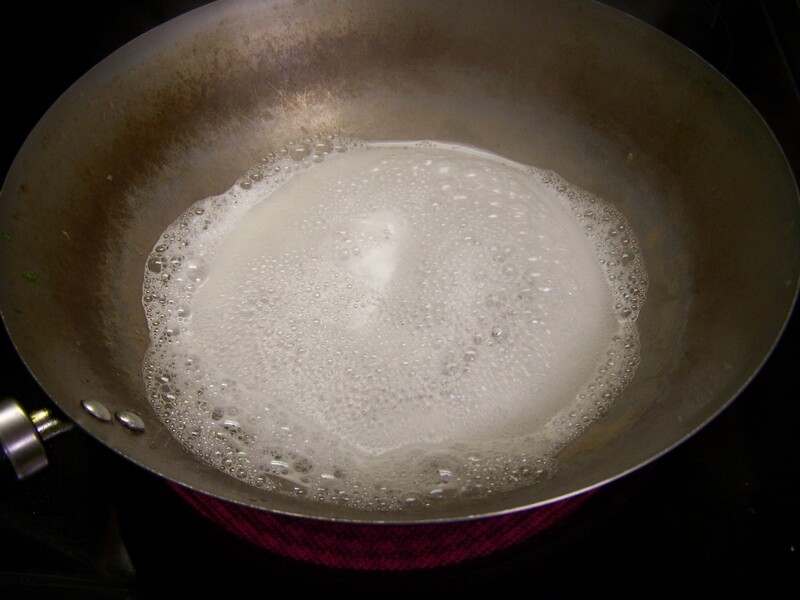 After, the best way to clean the wok is to get it hot and then add soapy water, then rinse. I made this on my birthday this year. I love this recipe. First start with the Mandarin pancakes. 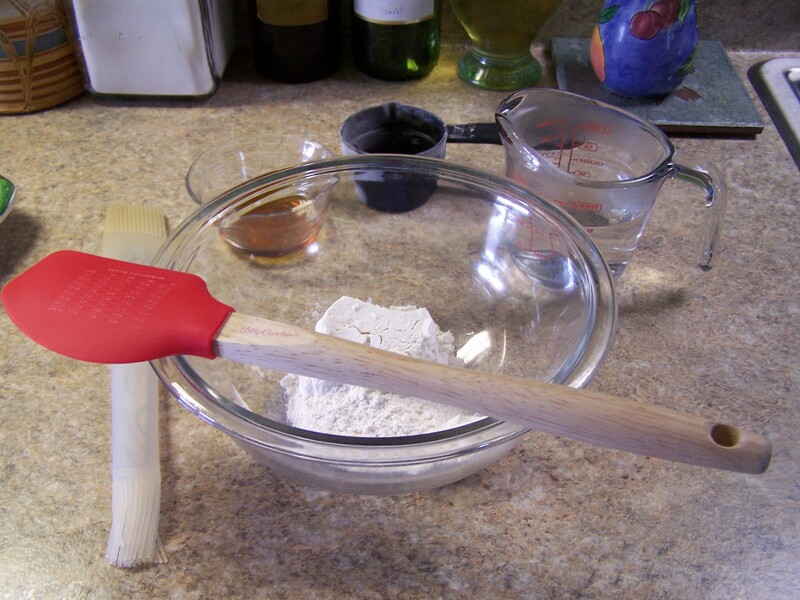 In a mixing bowl put the flour, and gradually stir in the water, mixing to make a thin batter. Work the dough until smooth. Place the dough in a bowl, cover with a dish towel and let rest for 45 minutes. Roll out to 1/4-inch thickness. Cut into rounds with a 3-inch cutter. Brush a small amount of sesame oil on top of 1 round. Place another round on top and press together. Roll the 2 rounds together to form a circle about 6 or 7-inches in diameter. Heat a large non-stick skillet over medium heat. Cook 1 pancake at a time until barely golden and dry on both sides, turning once, about 1 minute. 1. 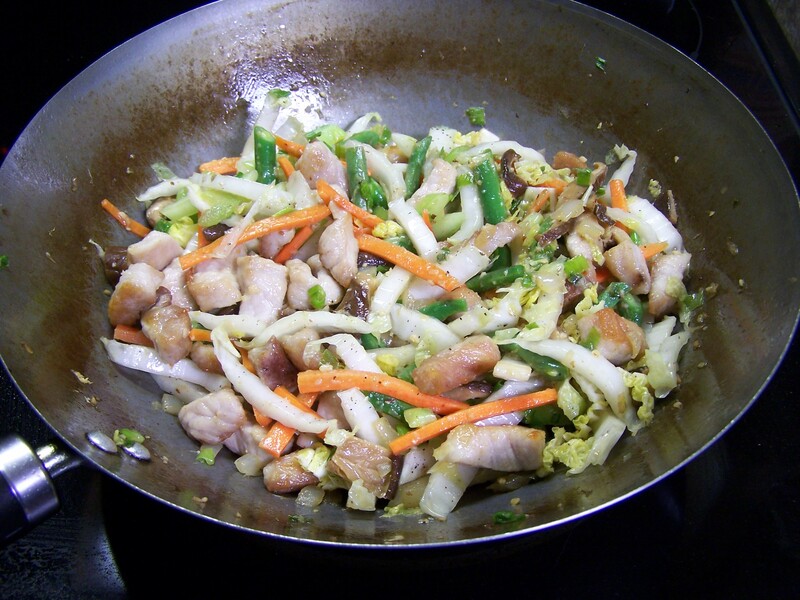 In a wok filled with 3 TBSP oil, bring to high temperature and add the pork. 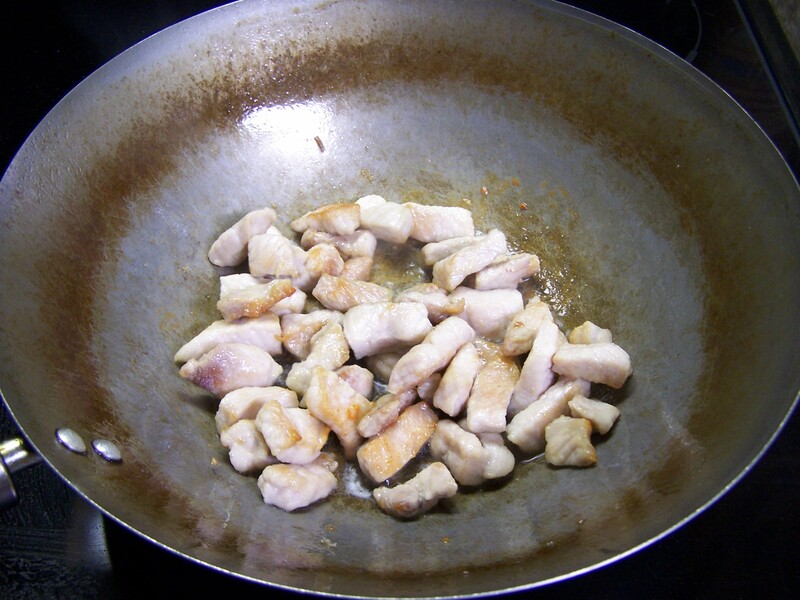 Using a strainer, quickly stir around the pork and cook until lightly browned. Remove, strain pork and set aside. 2. 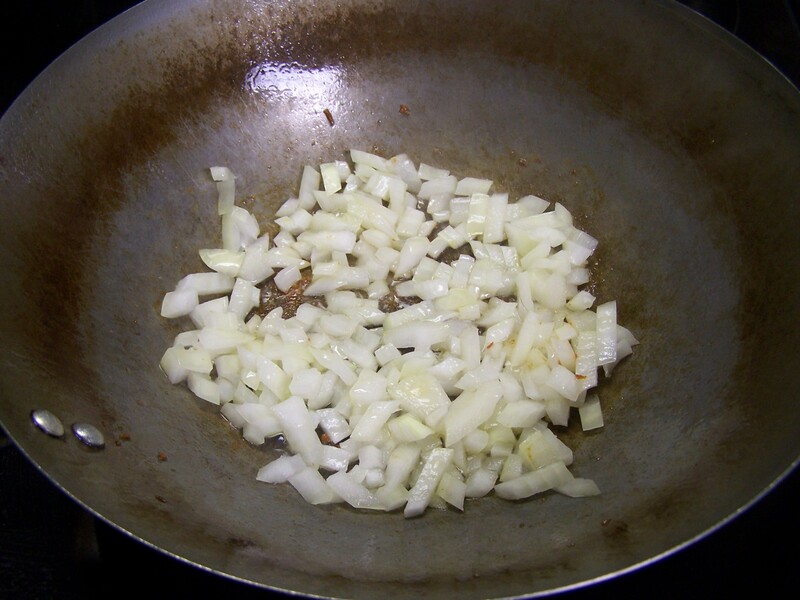 Leave 1 tablespoons of oil in the wok and return to high heat. 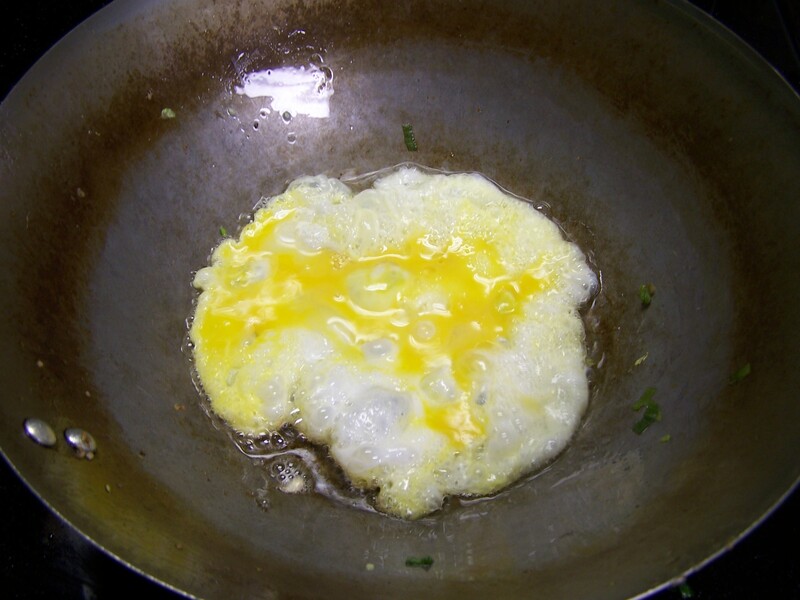 Add egg to hot oil and scramble. Set them aside with cooked pork. 3. 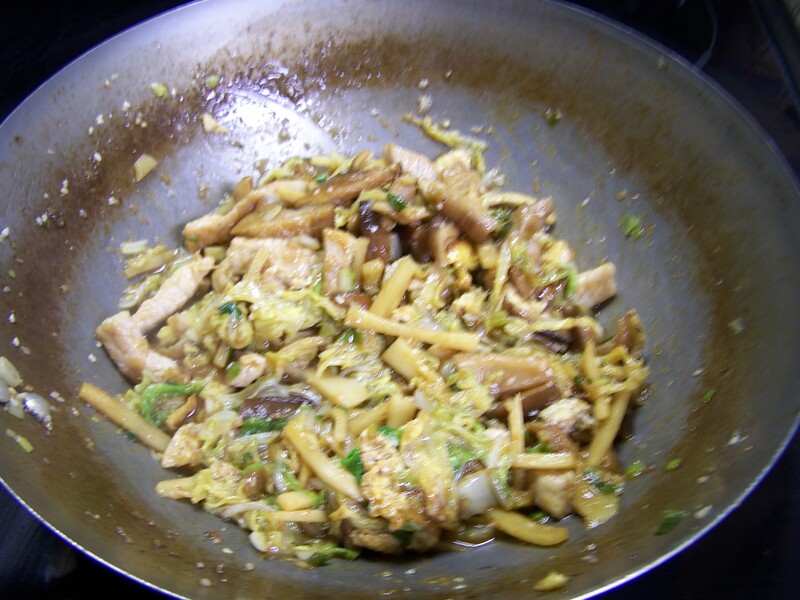 With remaining oil in wok, stir fry the garlic, ginger, shiitake mushrooms and sesame seeds until soft, about 2-3 minutes and season with kosher salt and freshly ground black pepper. Remove and set aside. 4. 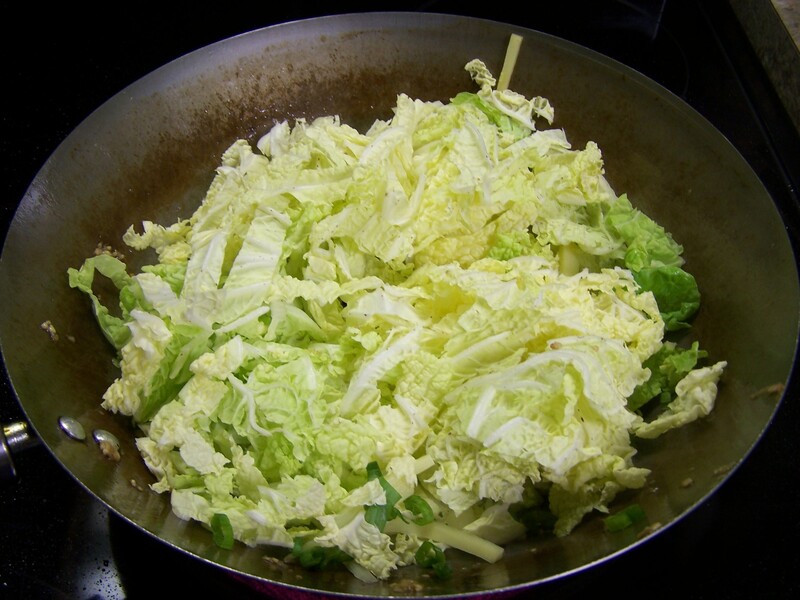 Add the cabbage, bamboo shoots and scallions and continue stir frying 2-3 minutes. 5. Add back all previously cooked ingredients. 6. 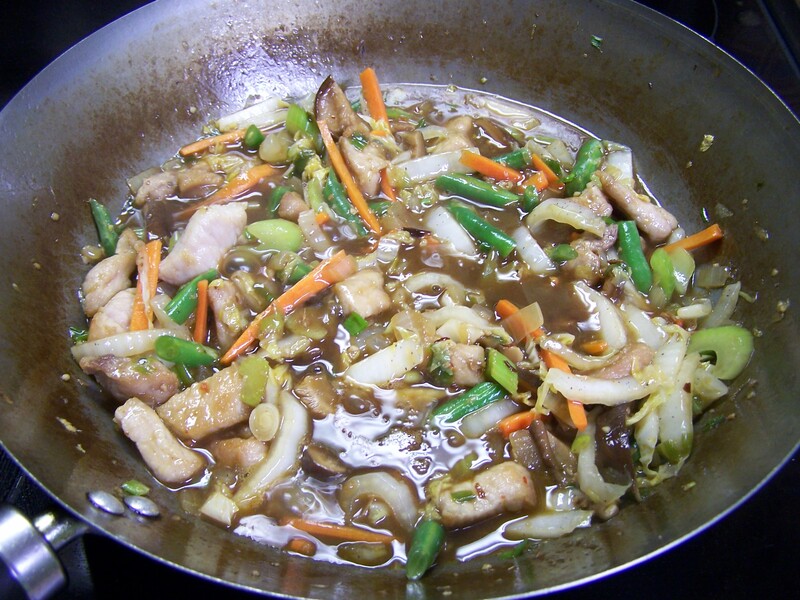 Add the hoisin sauce and check for flavor. 7. Meanwhile, reheat the pancakes until hot. 8. Lay individual pancakes on plates and top with Moo-Shu.